"This is a sure winner in any home. Be sure and cover the table with old newspapers to gather the shells and make clean up easy. Make sure to have warmed French bread to dunk in the 'sauce'! Bibs would be nice to protect your clothing from the sauce but not necessary." Wash shrimp and drain well. Melt margarine/butter in a one quart casserole dish. Add salad dressing, lemon juice, black pepper and garlic powder. Add shrimp to the casserole dish. Stir gently to cover the shrimp with the mixture. Cover and bake, stirring occasionally for 25 to 30 minutes or until shrimp are pink. 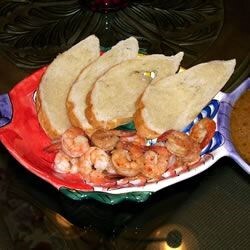 Serve the shrimp hot on a large platter and place the sauce in individual bowls so that you can easily 'dunk' bread in the sauce! Very tasty, and definitely a keeper. I used fat free italian dressing and it came out just fine, especially with all the butter.